Reading books before one has paid for them is quite a common practice in Japan. This and many bookshops do not attempt to stop it. "Reading Standing Up" (tachiyomi), as it is called in Japanese is hardly considered to be immoral, and in this case, there did not seem to be any injunction not to do so. In some book stores selling first hand books there are facilities for people to sit down and read the books prior to purchase. But even in those cases where book stores have signs saying "no reading standing up," the practice seems to be very difficult to prevent. 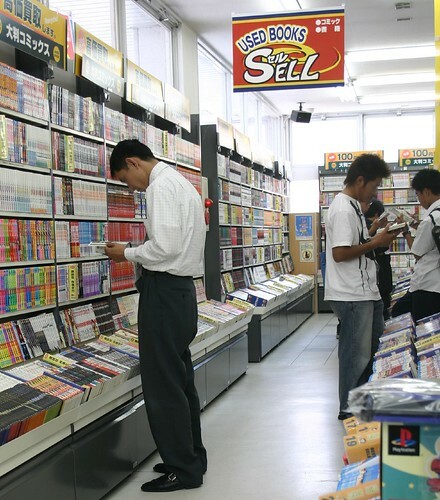 Convenience stores are often lined with high school students reading their way through a manga book or two while waiting for the bus. Bearing in mind that a high school student can read a manga in about 10 to 15 minutes, and each costs about 8 US dollars a copy, this represents a considerable expense. The same Japanese would not steal a camera if it were left on a park bench, and (like me) may leave the front door of their houses open when they go out. Where I come from you can't leave a car or bicycle unlocked for more than a few minutes before some one will steal it thinking "its asking to be taken," and yet the number of people "stealing a read" is comparatively few. I think that at the present time Japanese society has generally less thievery of all kinds than the UK. But I find it interesting and notable that the Japanese excel in some areas more than others. The faces of the people in this photograph have been blurred to disguise their identity even though THEY ARE NOT DOING ANYTHING WRONG. I repeat that this particularly bookshop did not seem to object to people reading the books at all, so the people in the photograph are not stealing anything.